THE Fingertec 6686 fingerprint lock from Biometric Access Systems Pty Ltd has several impressive features: stylish design, ease of use, and tough robust metal construction. Once a fingerprint is registered all the user has to do is simply slide up the weather cover and scan their fingerprint to gain access. Fingerprint locks would become the norm as more people would like to enjoy a keyless lifestyle using the fingerprint technology. Now it has become affordable from less than AU$500 only. * The Fingertec doorlocks also offer individual user deletion, PIN code access and manual override keys, in an emergency. * Weatherproof sliding cover protects biometric sensor from dust, UV and moisture. 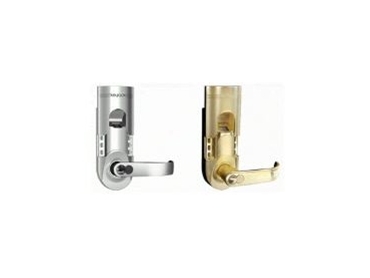 * Stylish appearance, superior structure, makes this the most robust and reliable fingerprint electronic lock. * Suitable for home or office. * Easy to install and operate. * Nightime use is easy with backlit fingerprint reader. * "Nanotechnology" surface material is highly resistant to corrosion. * Adjustable backset 60mm or 70mm. * Soft music tone signals readiness to scan fingerprint and low battery warning. * For security reasons only administrators can add users or delete users, this is great if an employee leaves, no more rekeying locks. * It is also very useful around the home, as the user can issue a tradesman or cleaner a PIN number, for that day to gain entry and then delete there code, after they have gone, no more concerns about who has copies of important keys. * Please Note: If installing this lock on a door with a deadbolt above the latch, there will likely not be enough clearence to lift the sliding cover unless the deadbolt is less than 6mm deep.